Budgeting: How I keep track of all those numbers. I talk a lot about budgets on this blog, so I thought it only fitting to show you how I actually budget and the tools I use to stay on track. Hopefully they will be helpful for you too. I utilize three ways to budget: A Budgeting App, Excel Spreadsheets and, my personal favorite, paper & pen (and a few markers). Yep, I’m a YNABer. It stands for You Need A Budget, and it’s the best tracking budget software I’ve ever used. Its basic concept, budgeting just the money you have right now and getting one month ahead is game changing. I’ve been able to save so much money just by using this program. If you want to see YNAB in action, Connie Porter, a YouTuber and friend, has great videos on how she tracks her own budget using this software. Free video training can be found here as well. If you want to see if it can work for your budget, you can try it out for 34 days free here. Yearly planning has become very important to me as well. I absolutely love having my year all mapped out and focusing on my yearly goals. It’s very motivating to see how much I can save, but also eye opening seeing the absorbent amount I spend on my mortgage. 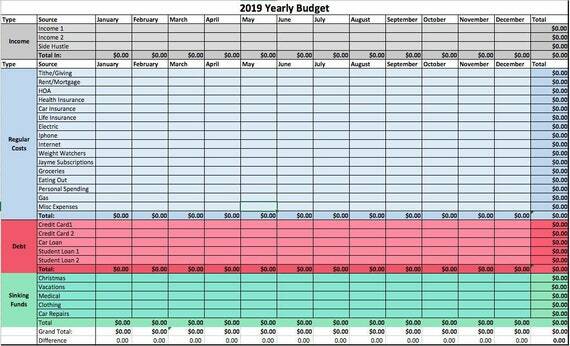 😦 Planning out a whole year can be a daunting task, but Kelly from Freedom in a Budget, has taken most of the work out of it and created a yearly budget template It is $5 (less than a Starbucks coffee) and it has saved me hours of figuring out formulas and set up. If you are a spreadsheet nerd, you might also like her monthly zero based budget. You can download her monthly budget template ($5) as well. This is a great way to track your income/spending for the month. And, once you download her templates, you can copy it over and over, year after year. How to survive winter: Rent a condo on the beach in Florida for three months. It’s no secret that I’m not a fan of winter. However, constantly focusing on being somewhere else, especially when I can’t be, is not a good way to live. So I devised a new list of things I can actually do to enjoy the long winter months and hopefully some will resonate with you too. Go for a walk. (Note to self: I need a warm pair of gloves). Yes, even though there is snow and it’s cold, most likely I can still walk outside. I can enjoy the surroundings of the snow on the branches. I can breathe in crisp fresh air. Train for a Spring 5K. I have a treadmill. ‘nuf said. Sign up and take ballroom dance classes with my husband. I want to learn how to “partner” dance with my husband. Winter is a perfect time, since we will be indoors. Declutter. Getting rid of stuff is ongoing. Binge watch a series. Parks and Recreation, Northern Exposure, Everybody Loves Raymond. Make slow cooker meals. So many to choose from here. Have a Spa Day. If the bank account allows, go to a spa for a day. Have a massage, get nails done. If the bank account does not allow, do nails at home, soak in a hot bubble bath. Journal. Yes. Get my creative juices working, working through problems or just letting off steam. Write a book. I’ve always wanted to. I spend a lot of time indoors in the winter which makes it a great time to write. Re-read Simple Abundance, by Sarah Ban Breathnach. By the fireplace, with a hot drink. Browse a book store. Barnes and Noble is still open, thankfully. Bookstores are so therapeutic for me. The smell of coffee, new books, new adventures to read. Plan a summer vacation. Now is the time to plan a vacation for the summer. Rentals go quickly, cruise cabins are on sale. Now all I need is everyone’s schedule. Bring a little Spring into the house. Buy some new green plants, and have live flowers on my kitchen table. Go to a winery. We have a ton of wineries in the area. One in particular has a huge fireplace inside. Trying out some new wines by the fire sounds divine. Feed the birds. Learn the different species that come to my bird feeder. Watching birds is very relaxing. Knowing what kind they are is just plain cool. Remember to be grateful. For a warm home, a warm bed and hot food. Sleep. Rejuvenate with extra sleep. It does a body good. Online Banks for Personal Savings. Which one is the best? Online banks are a great place for all those looking to park some savings without risk. I’ve been using Ally Bank (not sponsored, or affiliated), and have been very pleased with the consistent increase in paid out interest. It’s a great place to put an emergency account, sinking funds or college savings that you will be needing within a year or two. Many bloggers/YouTubers suggest Capital One, which is another online bank with the same type of services. There is an opportunity to make money by being an affilliate with Capital One that Ally does not offer, however, that doesn’t help the average person looking for the best rate. Since both banks offer the same service, it really comes down to rate. For a quick comparison between the two – Capital One is currently offering 1%, up to $10,000, then 2.0% with a balance of $10,001. Ally is offering 2.20% with a minimum of $1. There are other online banks that offer even higher rates, such as MemoryBank (2.4%) and MySavingsDirect (2.40%). You can find other banks and rate comparisons here. Either way, most online banks offer much higher rates than the average brick and mortar bank and would be worth a look. Yearly goals can be overwhelming. You know it’s all about ‘action’ and following through, but how do you do that? Here are three simple steps to turn your large goals into bite size ones. Step 1. Break it down. Break down your yearly goals into quarterly, monthly, weekly and daily action steps. To illustrate, I’ll take my personal goal of reading 12 books and show you how I’ve done this. I’ve chosen these three books specifically to jump start all of my goals for the year by working on changing bad habits to better ones, actually completing things, and “spending less” inspiration. I’ll be starting with the book – The Power of Habit. It is approximately 300 pages. There are 4 1/2 weeks in January, so I’d have to read about 66 pages a week. There are 7 days in a week, so I’d have to complete at least 10 pages a day to stay on track to finish for the month. 10 pages a day not only seems doable, but I’m sure I can surpass this. Write a ‘to do’ list of each action step that will bring you closer to your goals and keep track of your accomplishments. I’m a planner girl, so this step is actually fun for me. I use a planning system with a personal size ring Filofax and a daily habit tracker. At the end of each day, I review what I’ve accomplished and which areas I’ve been slacking on. Step 3. Do the things. This, of course, is the most important step of them all. You have to actually do the action steps to achieve the goal. By following these simple steps you should be well on your way to achieving all of your goals for 2019.